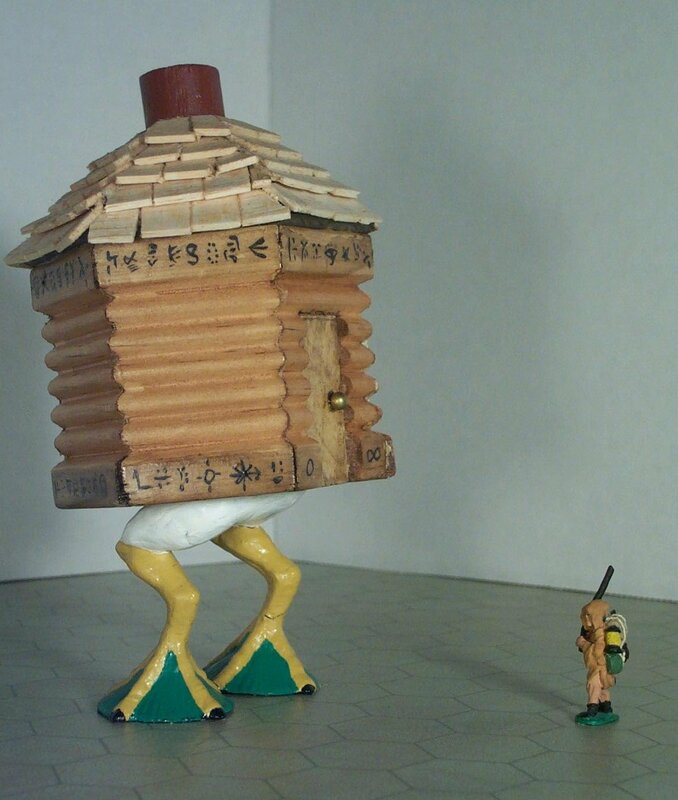 Although there are a ton of great miniatures out there, it often turns out that nobody has ever made miniatures for certain monsters. This may be due to its size, rarity, or other reason. When this happens, I sometimes resort to just making my own. 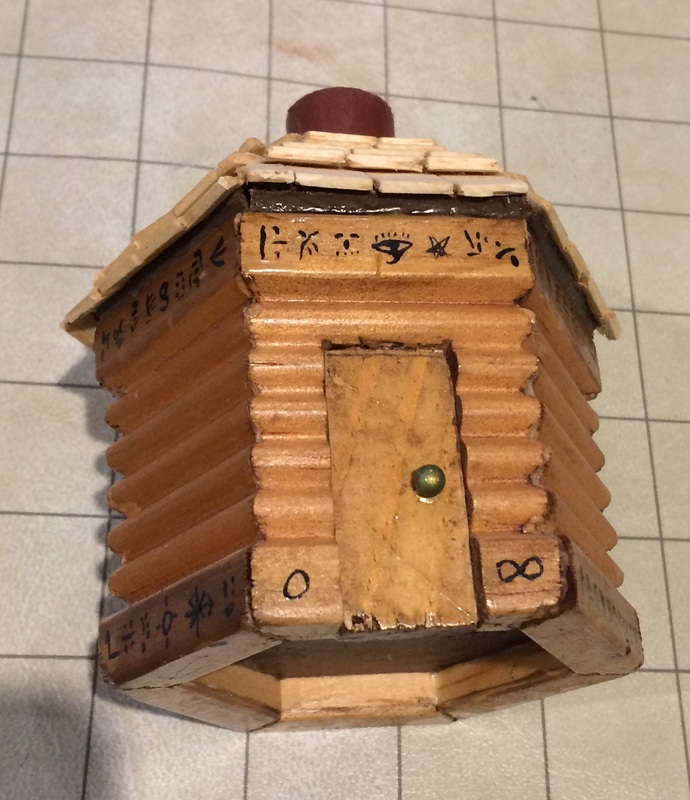 Below are all of my home made miniatures, and how I made them. 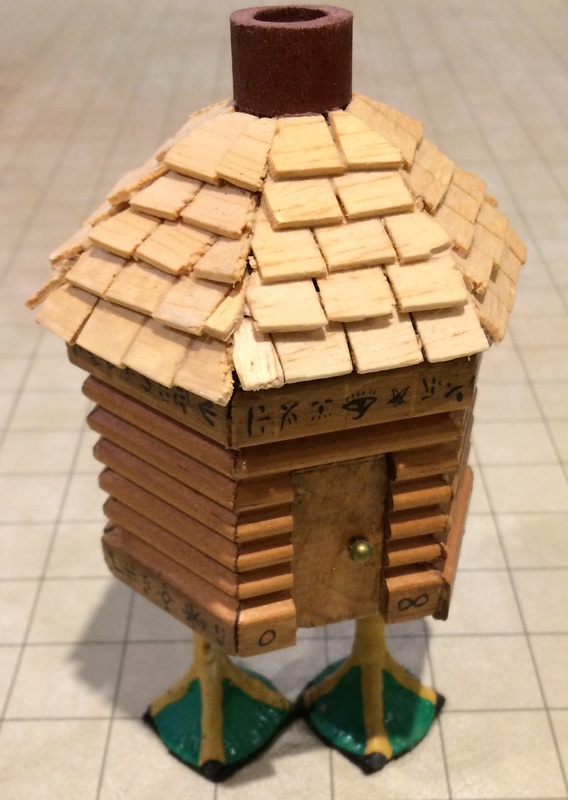 Baba Yaga's Hut has appeared in the Dungeons and Dragons game for years. 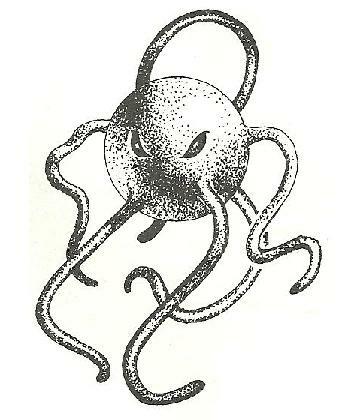 It first appeared as an Artifact in the 1st edition AD&D Dungeon Masters Guide. 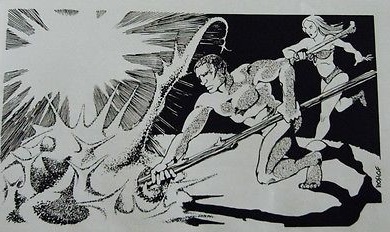 Later, a complete module based on this artifact was published in Dragon Magazine #83. 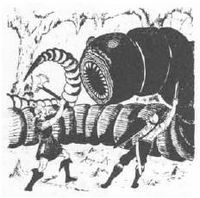 In 2nd edition AD&D, it was not mentioned in the DMG, but later it appeared in the Book of Artifacts. 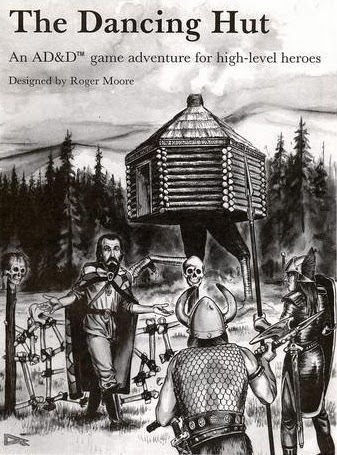 Later, it re-appeared as a complete module (#9471) published for 2nd edition AD&D, The Dancing Hut of Baba Yaga. 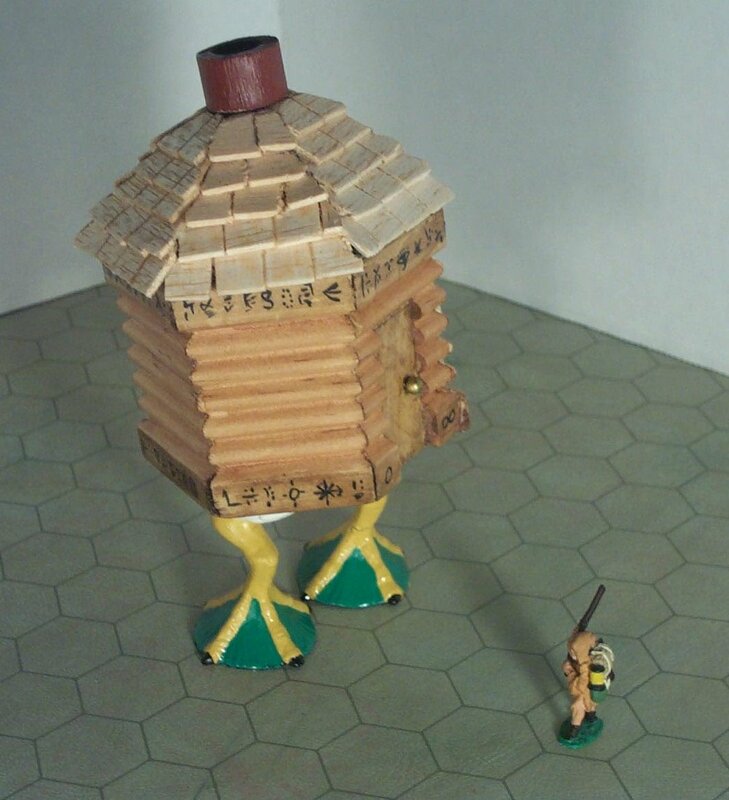 Due to its weird nature (a hut set upon dancing chicken legs), it isn't the sort of miniature that would work well in metal (lead, pewter, what have you) since it is so top-heavy. And I didn't think anyone would ever mass produce a plastic version, so I decided to make my own. The hut is made of soft wood (poplar and balsa primarily), making it extremely light. 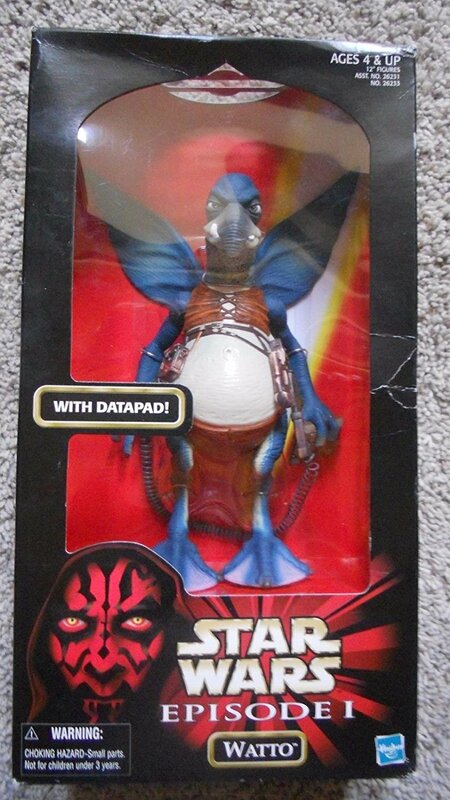 The legs are a hard, yet moderately flexible plastic from a Watto toy. I cut the legs off and painted them to look chicken-like. 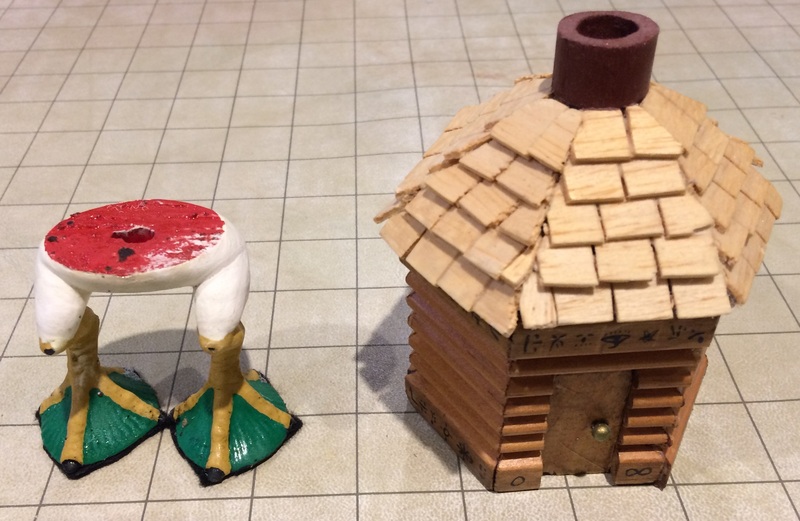 Because most descriptions of the hut indicate that the legs can "fold under the hut so that it can set flat on the ground", I made the legs detachable from the hut itself. "The Eye stands seven feet tall. Once it was human but to become the Eye it has been transformed. Its head has been replaced by a giant eyeball. Its body is slender and moves with a quick. light grace. The Eye normally dresses ln long green robes, trimmed with red. Eyes embroidered in golden thread decorate the hems. 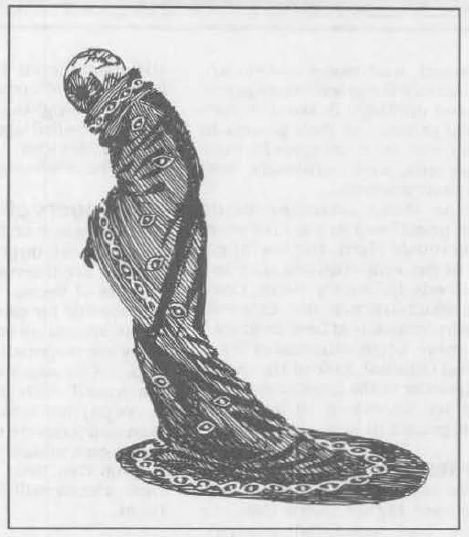 In public, it covers its robes with a gray cloak, and its head is concealed by a deep hood." 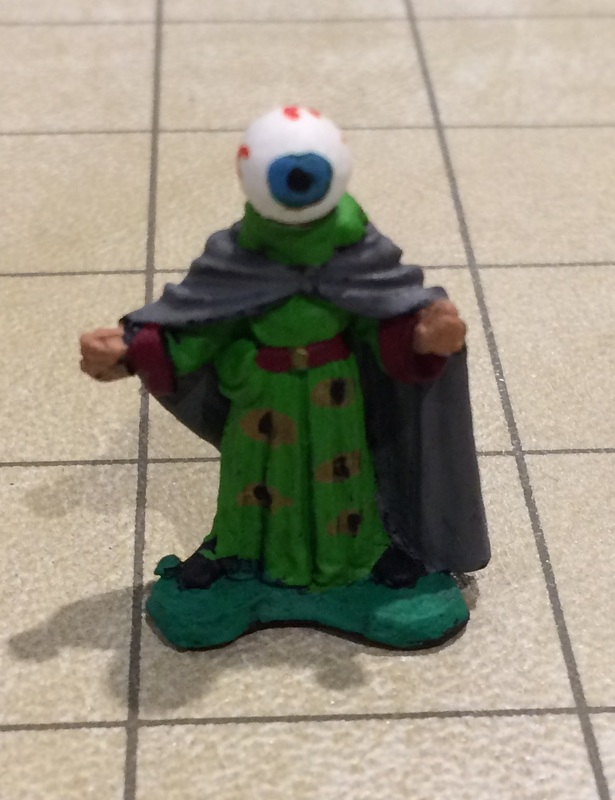 The Eye (of Vecna), as a monster, appears in TSR Module WGA4, Vecna Lives! 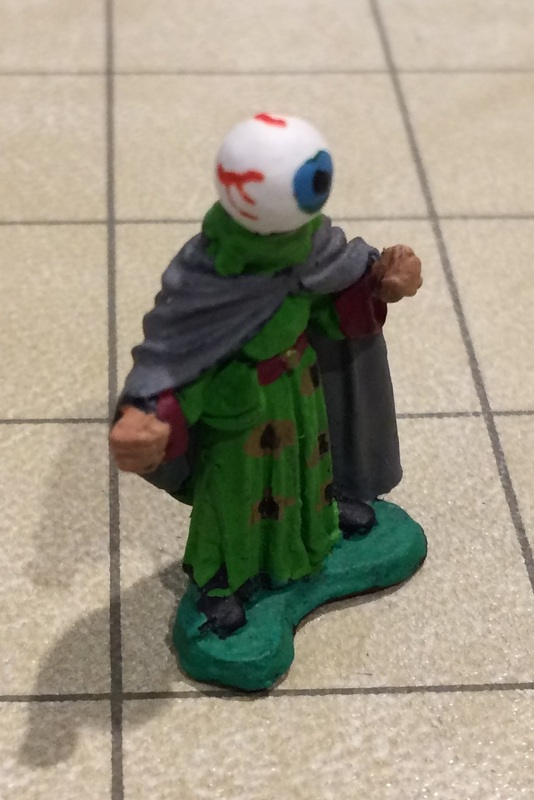 In order to make the mini, I took a pretty standard robed/cloaked wizard miniature that I had sitting around and clipped his head off (nail clippers work well, as the lead is soft). I then epoxied a pellet from a pellet gun in its place. The rest was just painting it to match the description. 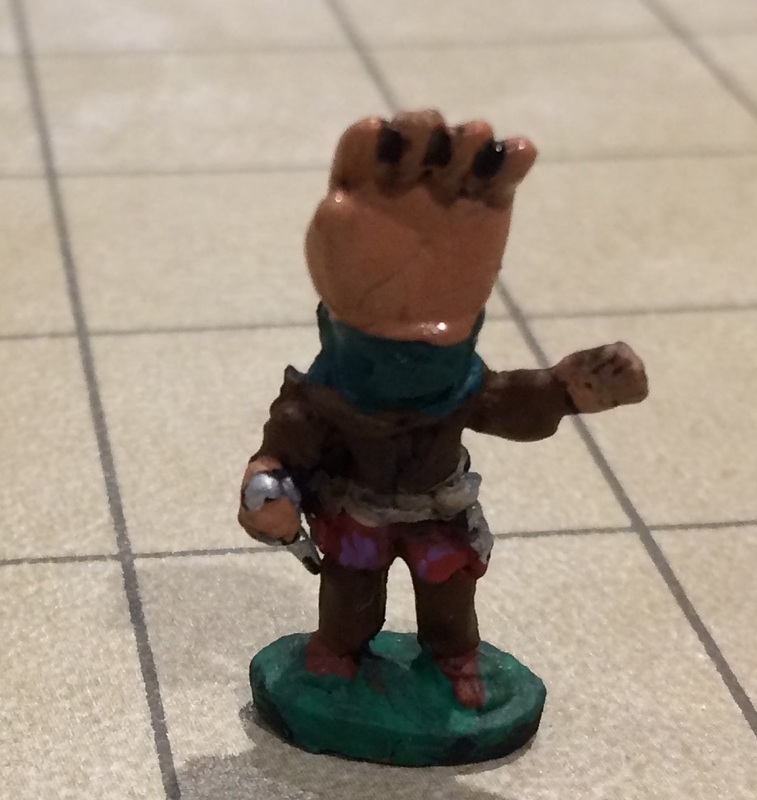 "The Hand is a squat, heavily-muscled humanoid, almost dwarven in size and shape. As part of the transformation, the Hand no longer has a head. Instead, a giant hand sprouts from its neck. There are no indications of mouth or sensory organs, yet the Hand does not seem impaired for the lack of these. The Hand dresses in a pleated kilt, decorated with colorful swirls and jagged stripes. A thick leather girdle, festooned with daggers, is its only other garb. In public it wears a blue-green robe with a large hood. 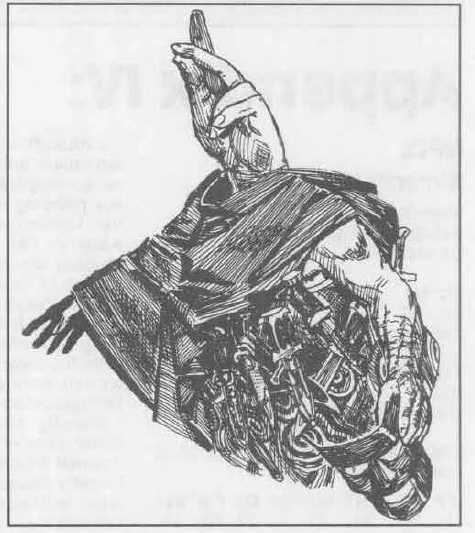 It grips an embossed leather mask to hide its 'face'"
The Hand (of Vecna), as a monster, appears in TSR Module WGA4, Vecna Lives! 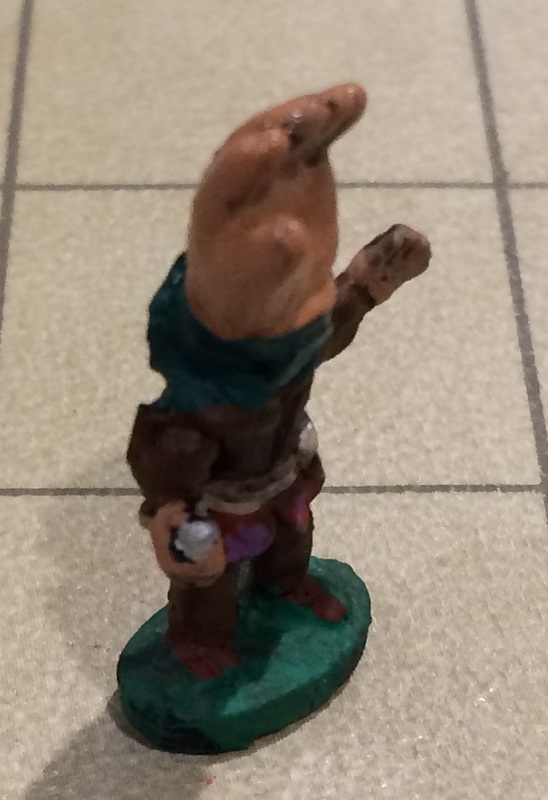 In order to make the mini, I took a halfling miniature that I had sitting around and clipped his head off (nail clippers work well, as the lead is soft). I then epoxied the hand from a small doll in its place. The rest was just painting it to match the description. "Generally only adult specimens, 8'-9' in diameter and 40'-50' long, are encountered. 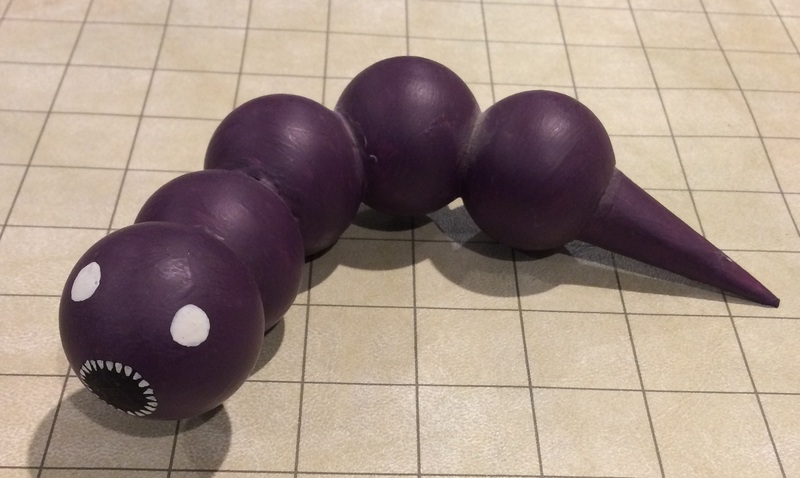 A mature purple worm can swallow, whole, a creature as large as 8' or so tall and up to 6' wide. Additionally, the purple worm has a poisonous stinger in its tail." 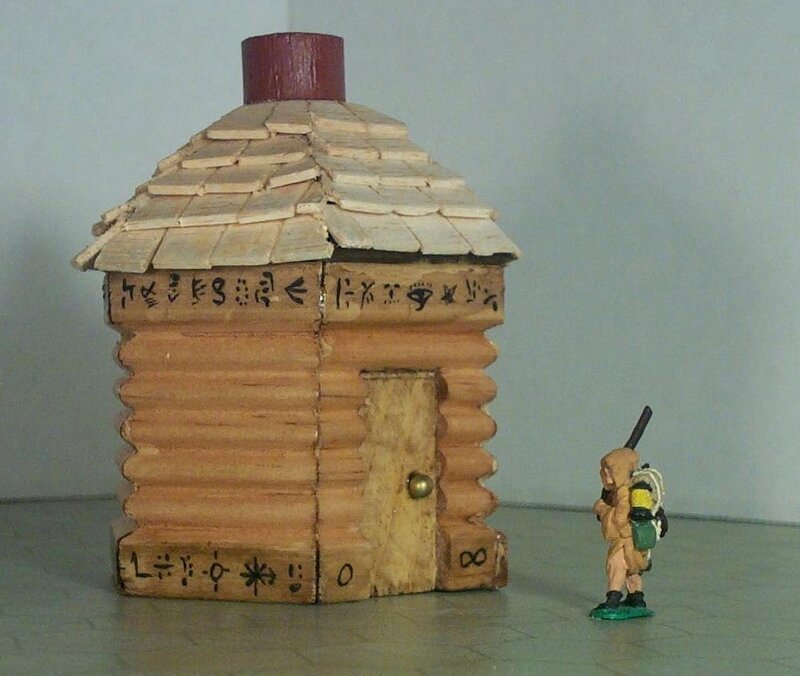 One of the first homemade miniatures I ever did. The body consists of a series of ping pong balls, with a circular cap cut out of each, in order to fit flush against the previous ball, each glued to the next. The tail/stinger is just a paper cone, cut and glued to the last ball. The whole thing is then painted to match the description. 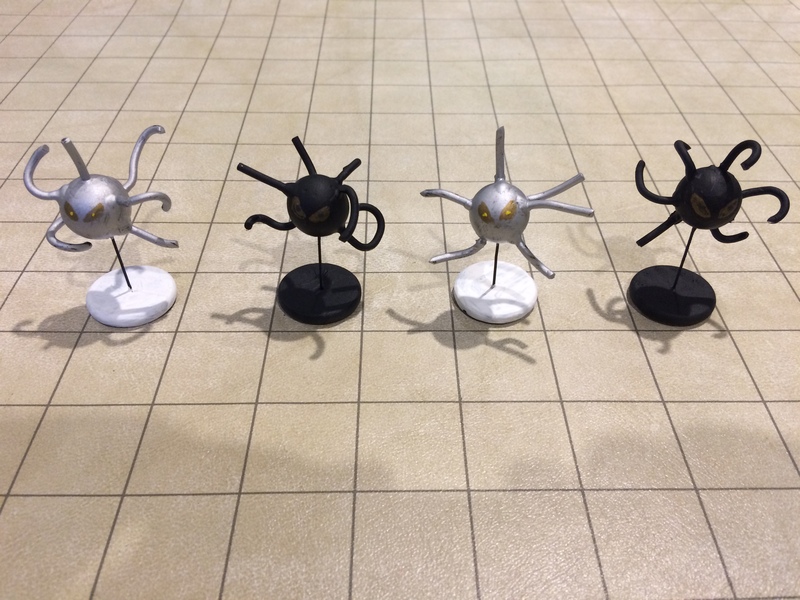 "Both creatures are spherical with many radiating, tentacle-like protrusions. Xag-ya have glowing golden eyes. Xeg-yi have dull metallic orbs." The Xag-Ya and Xeg-Yi miniatures begin with a marble. That is epoxied to the end of a thin pin which in turn is epoxied to a wooden disk. The tendrils are copper wire, cut and bent and then epoxied to the marble. The pin, disk and wire were bought at Michael's. The whole thing is then painted to match the description. 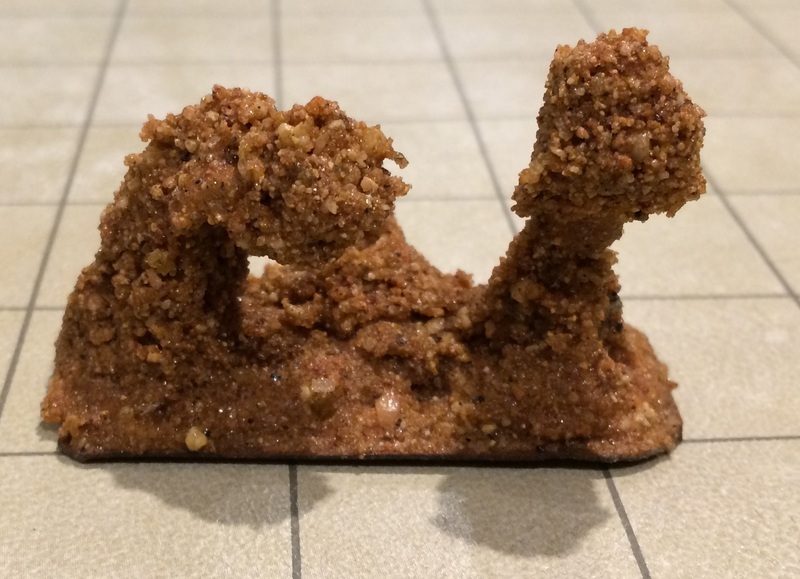 "A sandling appears to be an amorphous mass of moving, sliding sand....They fight by slashing and lacerating with a coarse, abrasive pseudopod." I realized that I needed a sandling when I was preparing to run A4. As such, I built my own. I began by building a base (about 1 inch by 2 inches), made out of stiff cardboard. I then mixed 1 part Elmer's glue with about 2-3 parts construction sand in a cup. I then pulled this out and molded it by hand into the base. I let it dry and then sprayed it with a clear coat finishing spray. 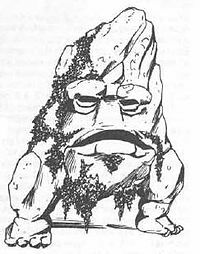 "The galeb duhr is a curious boulder-like creature with appendages that act as hands and feet." This one was pretty easy. I had decorative rocks like these around the garden and so it was easy enough to pick ones of the right size for the body. After that, I took a few others and crushed them with a hammer. I made facial features by selectively choosing small rock chips and epoxying them to the main body. Legs were done the same way. 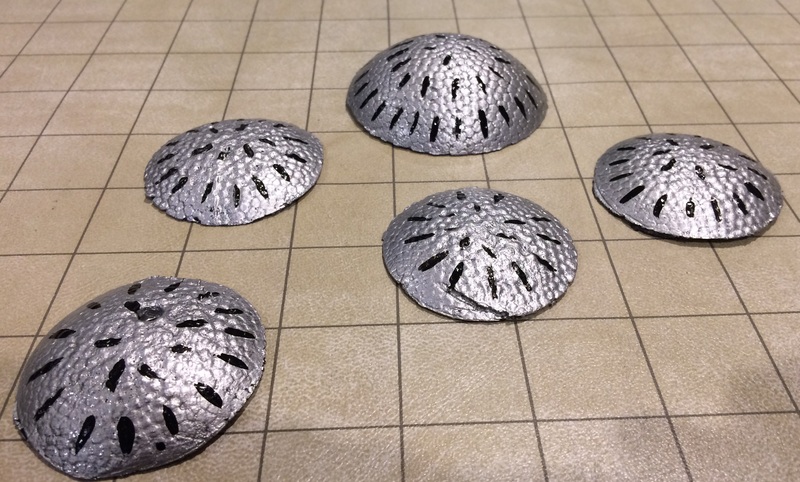 At the end, I epoxied the legs to metal miniature bases, which are available at any good gaming store. "This diabolical machine...consists of a low, elongated, metal dome, whose surface is broken only by small slits through which its weapons may be fired...There are three sizes of bozorg measuring 4, 8 and 12 feet in length..."
These guys appeared in module UK4, "When a star falls". As usual, I was prepping for the module and realized I needed a miniature for this monster. Thankfully this one was easy. I bought some styrofoam spheres at Michael's, and the figured with a 5 foot = 1 inch scale, how much radius each of the 4', 8' or 12' guys would be. I cut them off, and painted them silver and black. Shown here are the 8' and 12' guys. Prismatic Sphere "...an opaque globe of shimmering, multi-colored spheres of light...This scintillating sphere flashes all the seven colors of the visible spectrum..."
Ok, sure it's a spell effect, but c'mon, this one is fun. 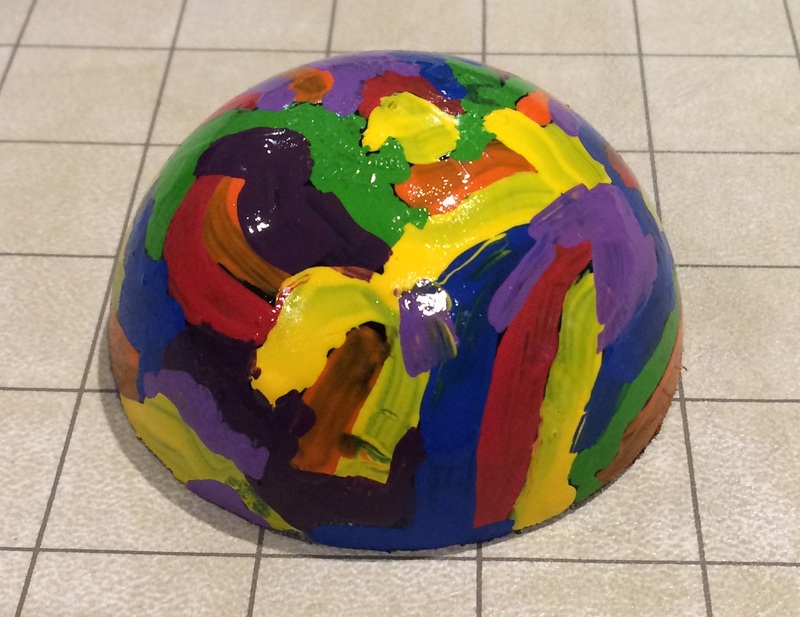 It's nothing more than a whiffle ball cut in half and painted with 7 colors of the rainbow.